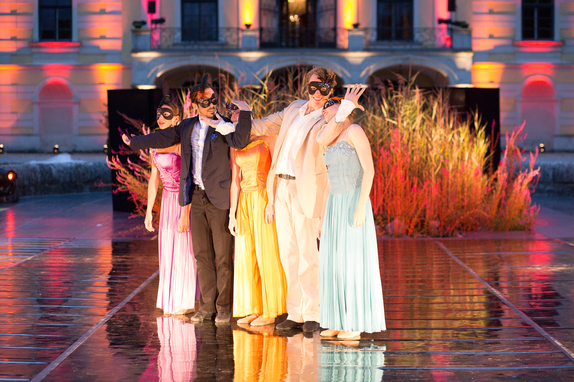 We had a beautiful performance tonight on Friday 20 July. Unfortunately rain knocked out most of the second half but Mária Kmeťková and Andrea Bučková offered guests a fabulous piano, harp and voice concert for a great finish to the evening. At least Mercutio didn’t have to die (just before his death, the rain came). 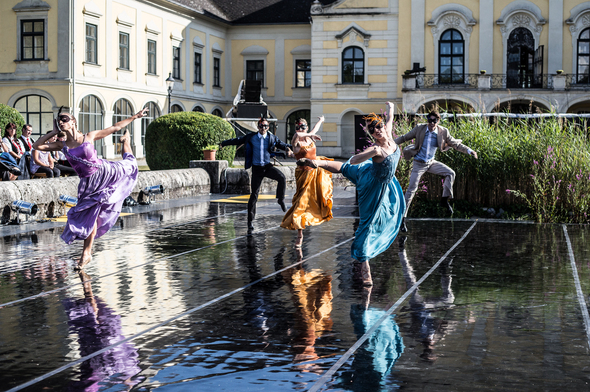 Great news though: we have prepared to dance inside the Festsaal in case of rain tomorrow. If the weather is good, the ballet remains outside. Tomorrow (July 21) unused tickets from the July 13, 14, 15 and 20 are accepted (as the weather has always been uncertain). Used tickets from July 20 are accepted as well as visitors didn’t see the full second half. Of course, the tickets for July 21 are also accepted. If you have any questions, please call +43 664/735 75 305 (German and English) or +421 948 335 435 (Slovak and English). We look forward to seeing you tomorrow at the show! This is from the afternoon performance on Sunday 15 July, hence the bright sunlight. For evening performances, there is a dark and romantic atmosphere with the castle behind lit (see photos). Patricia Barker is Lady Capulet, Rachael Riley is Juliet, Andrej Szabo is Tybalt, Arthur Abram is Romeo and Daniel Corbeil is Mercutio. 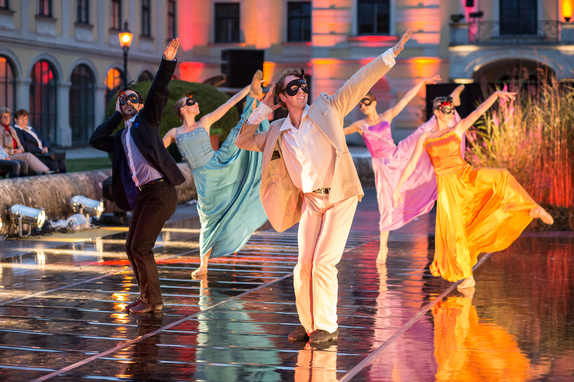 Choreography Mario Radacovsky. Dancers from Balet Bratislava and Grand Rapids Ballet Company Michigan. Andrea Bučková studied Theater Directing at the Theatre Faculty of the Academy of Performing Arts in Bratislava. She developed her passion for music very early in her life. Her first compositions, created at the age of 16, were met with positive reviews from the critics. At the moment, Andrea devotes most of her time to composing her own songs, playing the piano as well as singing. Her music is capable of impressing even the most demanding audience. Andrea’s emotional song arrangements, the extraordinary combination of piano, vocal and harp colours and experimenting with the usual sound of harp – those are the things that create a very special music project that can be characterized by strong musical themes and strong emotions, tenderness and temperament. We will be adding an additional evening performance Friday 20 July at 20.00 (not 16.00 as on the original German poster, definitely 20.00) to make up for the lost Saturday 14 July Performance. All tickets from rained out performances will be honoured on either 20 or 21 July at your choice. If we need additional VIP seating we will put it in. Thanks for being part of KittseeTanz! The performance on Sunday is taking place. The weather report for the afternoon shows some sun. We have a dry floor for the dancers and dry chairs for the audience. Thanks to all who attended the beautiful premiere last night. At the last minute we had sunshine as well as eight mayors of neighbouring towns. The weather is looking rough again tonight. 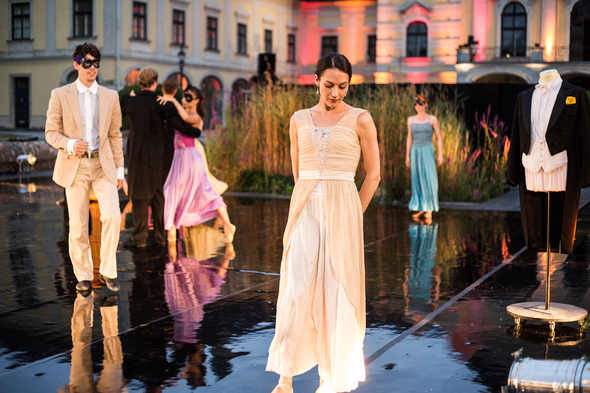 If the ballet cannot take place, the Katka Knechtová concert will take place in side the castle at 10pm.